Cantera Partners LLC (აშშ, ნებრასკა) აცხადებს სატენდერო წინადადებების მიღებას 1,000 მეტრული ტონა (+/- 5%) ამერიკული სოიოს შროტის სატენდერო რეალიზაციაზე. სოიოს შროტი არის ამერიკული წარმოშობის და საქართველოში გამოიგზავნება ნაყარი სახის შეფუთვით. აშშ-ს პორტიდან ხორბლის ნაყარი ფორმით ხომალდით ერთჯერადად ტრანსპორტირება 2019 წლის აპრილისთვის იგეგმება. ტვირთის საქართველოში (ფოთის პორტი) სავარაუდო ჩამოსვლა 2019 წლის მაისშია მოსალოდნელი. ფიზიკური მოთხოვნები: სოიოს შროტის საკვები აკმაყოფილებს ზეთოვანი მარცვლების გადამამუშავებელთა ეროვნული ასოციაციის (NOPA) ვაჭრობის წესების მიერ 2012 წლის ოქტომბერს დადგენილ სტანდარტულ სპეციფიკაციებს. გადაზიდვა: ტვირთის საქართველოში შემოსვლა (გარანტიის გარეშე) 2019 წლის მაისში იგეგმება. სოიოს შროტის დაახლოებით 1,000 მეტრული ტონა (+/- 5%) ხელმისაწვდომია შესასყიდად. ყველა დაინტერესებულმა პირმა უნდა წარმოადგინოს სატენდერო წინადადება აშშ დოლარში (USD) და ინკოტერმს CFR საქართველო, ფოთის პორტის ბაზაზე. გამარჯვებულმა პრეტენდენტ(ებ)მა კონტრაქტის ღირებულების 10%-ის გადახდა წინასწარ ნაღდი ანგარიშსწორებით უნდა მოახდინოს და დარჩენილ 90%-ზე სრულად წარმოადგინოს გამყიდველისათვის მისაღები ბანკის მიერ ინგლისურ ენაზე გაცემული შეუქცევადი, დადასტურებული დოკუმენტური აკრედიტივი ტვირთის აშშ-ს პორტის დატოვებამდე. კონტრაქტის მინიჭების შემდეგ, პრეტენდენტი ვალდებულია დოკუმენტური აკრედიტივი ნასყიდობის ხელშეკრულების გაფორმებიდან 10 სამუშაო დღის ვადაში გახსნას. დოკუმენტური აკრედიტივის ყველა პირობა უნდა იყოს შეთანხმებული და მისაღები ორივე მხარის მიერ. მიუხედავად იმისა, რომ აკრედიტივის წარმოდგენა აუცილებელია, გამყიდველს შეუძლია განიხილოს მისი წამყვანი ქართული ან საერთაშორისო ბანკის მიერ გაცემული საბანკო გარანტიით ჩანაცვლება, იმ შემთხვევაში, თუ საფუძვლიანად დასაბუთდება აკრედიტივის გამოცემის არაპრაქტიკულობა. ტენდერის მონაწილეებს განაცხადის წარდგენა შეუძლიათ მთლიან ან ნაწილობრივ შესყიდვაზე. შესყიდვის მინიმალური ლოტია 500 მეტრული ტონა. ნასყიდობის ხელშეკრულების ნიმუში იხილეთ http://canterapartners.com/soybeanmeal/ ბმულზე. Cantera Partners LLC, Nebraska, USA, requests bids for the purchase 1,000 metric tons (+/- 5%) of U.S. Soybean Meal (Meal) (+/- 5%), The Meal is of U.S. origin and will be shipped in bulk. The expected shipment period of this Meal from U.S, port is April 2019 in one bulk shipment(s). The estimated arrival in Georgia (port of Poti) will be May 2019. Physical Requirements: The soybean meal shall meet the standard specifications of the National Oilseeds Processors Association (NOPA) trading rules of October 2012. Shipment: The shipment is estimated to arrive in Georgia, without guarantee, in May 2019; approximately 1,000 metric tons (+/- 5%) of Meal is available for sale for which all interested parties should submit their bids in U.S. Dollars ($) and Incoterms CFR (C&F free out) port of Poti, Georgia basis. The highest bidder(s) will have to pay 10% of the contract value in cash and need to provide an irrevocable, confirmed letter of credit for 90% of the contract value, payable at sight and issued in English by a bank acceptable to the seller for the full amount prior to shipment from the US Port of origin. Upon being awarded the contract, the bidder will need to open the letter of credit within ten days after entering into a purchase agreement. The letter of credit terms must be mutually agreed upon by both parties. 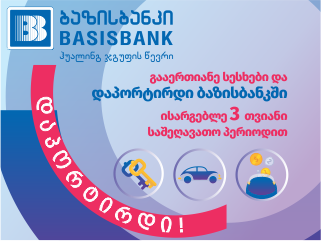 While a letter of credit is preferred, the seller may consider a bank guarantee by a leading Georgian or international bank if the L/C proves to be impractical. Bidders can submit bids on the whole or partial allotments. The minimum bid allotment is 500 metric tons for Meal. Initial Bid: Bids should be submitted in U.S. Dollars ($) and Incoterms CFR (C&F free out) port of Poti basis. Bids should be submitted within ten days of this announcement’s publication. Down payment: A successful buyer who signs a sales /purchase contract with seller will be required to pay a down payment that will equal 10% of the total contract value within 5 calendar days from signing the sales/purchase contract. Insurance and Title: Seller shall retain title to the commodities until seller has been paid in full in accordance to the terms of the letter of credit. However, it is acknowledged and agreed that risk of loss and insurance costs shall pass to bidder when commodities are delivered on board the vessel at the U.S. port. Any marine and overland insurance to cover specified loss or damage during the ocean voyage and inland transport of the commodities shall be at bidder’s sole responsibility and cost. Bidder shall be responsible for clearing customs and paying all customs fees, duties, and taxes with respect to the importation of the commodities.Additional Terms: The Buyer agrees not to re-export the commodities outside of Georgia. Please submit your final bids by email to Michael Jung (bid@canterapartners.com) by Wednesday March 20, 2019. All bids must remain valid for 21 days.